A summary version of this article is also available. Judging from news reports, one might think that Palestinian nationalism has been active as long as Jews and Arabs have been living at the eastern edge of the Mediterra­nean Sea. And as Yasir 'Arafat rides high since his declaration of a Palestinian state, there is an understandable tendency in the West to accept at face value his insistence that the Palestinians have always sought an independent Palestinian state. In fact, this is far from the truth. The idea of an Arab state resting between the Jordan River and the Mediterranean Sea is, rather, a twentieth-century concept. In­deed, its origins can be traced with surpris­ing precision to a single year — 1920. In January 1920, Palestinian nationalism hard­ly existed; by December of that critical year, it had been born. The events of 1920 encapsulate the current successes and tribulations of the Palestinian movement. They foreshadow some abiding themes, such as the potential for rapid change and the major role of the Western powers. They also provide insight into the most widely supported but possibly the least successful nationalist cause of this century. Palestinian nationalism cannot be age-old. To begin with, nationalism itself origi­nated only in late eighteenth-century Eu­rope, and took hold among the Muslims even more recently. Until the early years of this century, the ancestors of today's Pales­tinians had thought of themselves mainly in terms of religion. Islam emphasized bonds between fellow-believers, allowing little scope for territorially-bound loyalties among Muslims. Like it or not, adherents of other religions also found themselves ar­rayed along religious lines. Coreligionists shared strong bonds, but they had few ties outside their own community. Religious lines became residence lines; except for spe­cific commercial or political purposes, little intermingling took place. A sense of com­mon political identity was entirely lacking. In addition to religious ties, loyalties were tied primarily to family; then came other genealogical relations, as well as some eth­nic, regional, linguistic, and class bonds. When nationalism reached the Middle East from Europe, it captivated Middle Easterners as much as it did other peoples. The dream of governments embodying the spirit of their people was utterly alien, to be sure, but it excited many. The difficulty in the Middle East, as in most places, was exactly how to apply the national ideal. Where would the boundaries be placed? Did the Maronite Christians constitute a nation of their own? Did the Christians of the Levant? The Syrians? The Arabs? The Mus­lims? In the early years of this century, theorists took each of these peoples as the basis for grandiose plans for their favorite nation. But not a single writer imagined a Pales­tinian nation, and for good reason. Palestine had always been, and at that time remained, a Jewish and Christian concept, utterly for­eign to the Muslims. Eretz Yisrael and Terra Sancta have no analogue in Islam. Muslims look to the Hijaz, not Palestine, for their most sacred landmarks. Further, there has never been an independent state in Palestine ruled by Muslims; such states that were brought into existence were ruled either by Jews or Christians. This point cannot be overemphasized. Palestine was brought into existence by Brit­ish imperial authorities, not by Arabs; fur­ther, Muslims felt defeated by the British carving out of a distinct Palestinian entity. I know of no Palestinian endorsing this act when it took place in 1920. To the contrary, every recorded opinion suggests intense opposition. What, then, was the objective of the Arabs living between the Jordan and the Mediterranean? What political unit did they endorse? To the extent that there was any proto-national unit to the east of the Mediter­ranean Sea, it was not called Palestine but Sham, the historic region of Syria which included the modern states of Syria, Lebanon, Israel, and Jordan. This choice reflected a basic fact about the Levant, now often forgotten: Sham, usually translated as "Greater Syria," was a truly age-old ecolo­gical and cultural (but not political) unit. Like Egypt, Arabia, Yemen, and the other large traditional units of the Middle East, it had geographic boundaries and ecological characteristics which made it distinct from adjoining areas. It constituted the western part of the Fertile Crescent, a dry region that supports life when—and only when—tended with great care. Residents of this area share a physical typology and an extended family structure. They speak Arabic with a distinctive lilt and prepare foods in a similar fashion. Just after World War I, a meeting of Arabs called for a united Syria on the basis that "the people speak Arabic; they are intermarried and have many links of kin­ship; and commerce has for ages moved freely between them." Even so, Pan-Syrian sentiment was ex­tremely weak before World War I; Greater Syria was, after all, only a proto-nationalist unit. Europeans and Westernized Syrians often remarked on the absence of national solidarity. Testimony on this subject is unan­imous. The well-informed author of a Brit­ish travel guide to Greater Syria noted in the mid-nineteenth century that "patriotism is unknown. There is not a man in the country, whether Turk or Arab, Mohammedan or Christian, who would give a para [penny] to save the empire from ruin; that is, if he be not in government pay ... The patriotism of the Syrian is confined to the four walls of his own house; anything beyond them does not concern him." Gertrude Bell, a knowl­edgeable British observer, wrote in 1907 that "Syria is merely a geographical term corre­sponding to no national sentiment in the breasts of the inhabitants." K.T. Khaïrallah noted in 1912 that "Syrian society did not exist in the past. There was nothing but distinct and often hostile groups. ... Society was based on a despotism of brutal force modeled on that of the ruler." By the end of World War I in November 1918, however, the notion of a Syrian nation had made considerable headway among the Arabs of Palestine. They agreed almost unanimously on the existence of a Syrian nation. With few exceptions, they identified with the Syrian Arab government in Damascus, headed by Prince Faysal, a member of the Hashemite family. Palestinian enthusiasm for Pan-Syrian unity steadily increased through mid-1920. There is ample evidence for this enthusi­asm. Three major Palestinian organizations propounded Pan-Syrian ideas in the imme­diate aftermath of World War I: the Arab Club, the Literary Club, and the Muslim-Christian Association. (Note that none of these names makes any mention of Palestine.) The first two groups went furthest, calling outright for unity with Syria under Faysal. Even the Muslim-Christian Associa­tion, an organization of traditional leaders — men who would expect to rule if Palestine became independent — demanded incor­poration in Greater Syria. The Muslim-Christian Association held a congress in January-February 1919 to draw up demands to submit to the Paris Peace Conference. Representatives of fourteen Palestinian cities and towns presented a peti­tion calling for Southern Syria to be "insep­arable from the independent Arab Syrian government." The congress declared Pal­estine "nothing but part of Arab Syria and it has never been separated from it at any stage." The delegates saw Palestine tied to Syria by "national, religious, linguistic, moral, economic, and geographic bonds." On the basis of this view, they called for a Palestine that would remain "undetached from the independent Arab Syrian Government." Musa Kazim al-Husayni, head of the Jerusalem Town Council (in effect, mayor) told a Zionist interlocutor in October 1919: "We demand no separation from Syria." According to Ahmad ash-Shuqayri (the man who headed the PLO in the 1960s), the ubiquitous slogan of 1918-19 was "Unity, Unity, From the Taurus [Mountains] to Rafah [in Gaza], Unity, Unity." The same appeal echoed from all corners. A singer in Ramla encouraged her "enraptured listeners" to join Faysal's forces. From San Salvador, of all places, a protest in March 1919 went out from the "Syrian Palestin­ians" to international leaders calling for "no separation between Syria and Palestine" and expressing hope that "Syria and Pal­estine remain united." The Salvadorans de­clared: "We trust that if Syria and Palestine remain united, we will never be enslaved by the Jewish yoke." 'Izzat Darwaza spoke about Palestine and [the need for] Syrian unity, then he submit­ted a statement for general opinion. No one disagreed with him. The discussion pro­ceeded further on this matter; some partici­pants wanted not to mention Palestine but to use the expression Greater Syria for all the regions of Syria, and they were applauded. The Congress passed four resolutions. The first of them noted that "it never oc­curred to the peoples of Northern and Coast­al Syria that Southern Syria (or Palestine) is anything but a part of Syria." The second called for an economic boycott of the Zion­ists in "all three parts of Syria" (meaning the whole of Greater Syria). The third and fourth resolutions called for Palestine "not to be divided from Syria" and for "the independence of Syria within its natural borders." 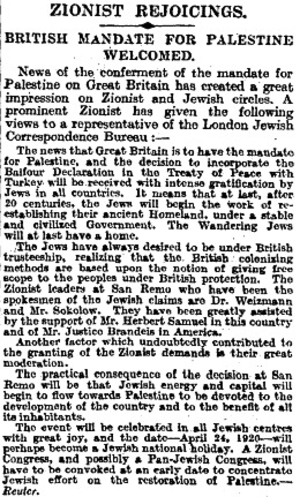 The Times of London headline reporting on the San Remo conference that created the unit of Palestine: "Zionist Rejoicings. British Mandate For Palestine Welcomed," Apr. 26, 1920. The crowning of Faysal as King of Syria in March 1920 elicited strong Pan-Syrian reactions among the Arabs of Palestine. The British military governor of Palestine re­ceived a petition (bearing Amin al­-Husayni's signature) that demanded the eradication of borders with Syria and the inclusion of Palestine in a Syrian union. Musa Kazim al-Husayni broke his promise not to engage in politics and spoke from the municipality building's balcony in praise of Faysal. 'Arif al-'Arif led a mass demonstra­tion in Jerusalem in which the participants carried pictures of Faysal and called for unity with Syria. Then, in April, came the sobering news from San Remo that the British and French governments had decided to separate Pal­estine from Syria and to keep both territories under their control. This precipitated pro­tests from all parts of Palestine. New calls went out for the independence of a united Syria stretching from Turkey to the Sinai. These and many other indications point to two indisputable facts: until July 1920, the Palestinian goal was to join in a union with Syria, while the aspiration of an independent Palestinian state barely existed. Matters changed quickly in the next few months, however. The French conquered Damascus and scuttled the Arab kingdom ruled over by Faysal in July 1920. One result was that Syrians came to devote almost all their atten­tion to the issue of French rule, leaving very little time or concern for Palestine. Another was that, for Palestinians, the attractiveness of a Syrian connection faded away. Why be joined to Damascus, the Palestinians felt, if this meant rule by Paris? Palestinian leaders came to recognize that they were on their own against the British and the Zionists. From that point on, they sought to establish an autonomous Arab government in Pal­estine which would be ruled by themselves, not by politicians in Damascus. Herein lay the origins of Palestinian nationalism. This reorientation was made formal by the Third Palestinian Congress, meeting in December 1920. Delegates at the Congress decided to drop the appellation Southern Syria and to stop demanding the joining of Palestine with Syria. At this moment, Pal­estine became acceptable to the Muslims; and it would not be long before they would actually find it appealing. Subsequent meetings confirmed this new identity. When the Syrian Congress (the main exile organization dedicated to build­ing Greater Syria) met in August 1921, Pal­estinians would no longer endorse the unity of Greater Syria. They even compelled the organization to rename itself The Syro-­Palestinian Congress and to issue a state­ment calling for the "independence of Syria and of Palestine." A year later, Palestin­ians withdrew from this Congress. This rapid switch suggests that, despite the apparent solidity of Palestinian interest in union with Syria, the sentiment was al­ways precarious. In large part, this has to do with the two sides, Syrian and Palestinian, having had different expectations. Prince Faysal, who, along with many Syrians in 1918-20, saw the Zionists as a less pressing danger than the Maronites of Lebanon, was willing to work with the Jews if they could help him achieve his Greater Syrian goal. In January 1919, for example, he reached an agreement with the Zionists. 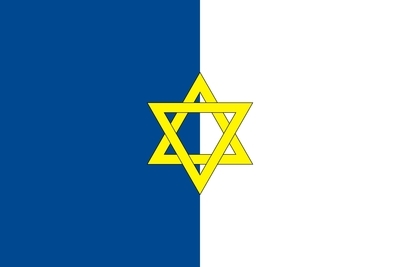 In return for Faysal's promise "to encourage and stimu­late immigration of Jews into Palestine on a large scale," he won Zionist backing for his campaign against the French. (But this agreement was contingent on Britain keep­ing France out of Syria; and since this was not done, the accord did not take effect.) Soon after, in a letter to Felix Frankfurter, Faysal noted that "there is room in Syria for both of us." Palestinian leaders, in contrast, saw Zion­ists as the pre-eminent problem. In their eyes, Faysal's standing depended almost ex­clusively on his ability to help them against the Zionists. In late 1918, the Palestinians considered Faysal (in the words of a French diplomat) the only Arab leader "capable of resisting the Jewish flood" into Palestine. Faysal's subsequent willingness to deal with the Zionists diminished Palestinian backing for him. This divergence in outlook created ten­sions between Syrian and Palestinian leaders from the moment World War I ended in November 1918. Signs of disaffection were apparent within three months of Faysal's arrival in Damascus, and they grew with time. Already in early 1919, the Muslim-Christian Association resolved that Pal­estine "should be part of Southern Syria, provided the latter is not under foreign con­trol." The Association's Jerusalem branch went farther, calling for an independent gov­ernment in Palestine to be only "politically associated" with Syria. It authorized Faysal "to represent Palestine and defend it at the Paris Conference," on the understanding that Palestine would enjoy full autonomy within a Syrian union. And while 'Arif Pasha ad-Dajjani, president of the Muslim-Christian Association, insisted that "Pal­estine or Southern Syria — an integral part of the one and indivisible Syria — must not in any case or for any pretext be de­tached," he also had doubts about rule from Damascus. To be fair, it must be recorded that argu­ments against connections to Damascus ap­peared in the press as early as 1919. The Arab Club was the first nationalist institu­tion to abandon Faysal's leadership. Despite its name, the newspaper Suriya al-Janubiya ("Southern Syria") led the campaign away from Pan-Syrianism, arguing that Syrians had become too absorbed in their conflict with France to pay enough attention to the Zionist challenge. In January 1920, when Faysal returned empty-handed from his sec­ond trip to Europe, some top Palestinians began to see him as not essential to their cause, an impression reinforced by the lack of Syrian response to the Jerusalem riots of April 1920. But these strains had only limited impor­tance. Syrian and Palestinian leaders effec­tively minimized their differences until July 1920, for both had an interest in Prince Faysal's success. What accounts for the extremely rapid collapse of Pan-Syrian sentiment in Pal­estine? Yehoshua Porath, the leading histo­rian of Palestinian nationalism, argues in his 1974 book The Emergence of the Palestinian-Arab National Movement, 1918-1929 that Palestinians supported Pan-­Syrianism only as long as it served them but abandoned it when it no longer had utility. In contrast to Syrians, who tended to see Pan­-Syrianism as an end in itself, he says, Pales­tinians saw it as a means, a weapon in the battle against Zionism; it was weak because it only served ulterior purposes. Being treat­ed as part of Syria had three advantages in the years 1918-20. [xix] A joint Anglo-French declaration of November 1918 promised "to encourage and assist the establishment of native governments and administrations in Syria and Mesopotamia" — not Palestine. This declaration made it desirable for Pal­estine to be seen as part of Syria. Also, associating with the larger Muslim popula­tion of Greater Syria offered a way to over­whelm the Jewish immigrants demographi­cally. And alliance with Faysal gave Pales­tinians a relatively powerful protector. Disappointment over the moderation of the Syrians toward Zionism cooled the Pal­estinians' enthusiasm for the idea of Pan-Syrian unity.... The orientation towards Damascus was based less on the growth of nationalism around this area [i.e., Greater Syria] than upon a given political situation. When this situation changed, the foundations of the Pan-Syrian movement collapsed. All these points are correct, but not the implication that Pan-Syrian nationalism was merely a tactic while Palestinian national­ism appealed to deep sentiments. The re­verse is closer to the truth. Existing sentiments fitted better within Greater Syria than Palestine. Palestinians abandoned Pan-­Syrianism and replaced it with Palestinian separatism for tactical reasons, not out of heartfelt sentiment. Porath himself quotes one Palestinian leader who openly admitted this. Only days after the fall of Faysal's government, Musa Kazim al-Husayni de­clared, "after the recent events in Damascus, we have to effect a complete change in our plans here. Southern Syria no longer exists. We must defend Palestine." Kamil ad-Dajjani explained many years after the event that "the collapse of Faysal's rule in Syria and the disappointment of the hopes which were pinned upon that rule, made Palestinians feel that the orientation toward a Greater Syria bore no fruit." Palestinian nationalism originated not in spontaneous feelings but in calculated poli­tics, and a long time passed before the emotional appeal of this premeditated and novel allegiance matched that of Pan-Syrian nationalism. In short, the Palestine concept served better than that of Greater Syria. It allowed the Arab leaders of Palestine to speak the same political language as the Zionists and the British. Rather than refer to some out­side source of authority, they could claim sovereignty for themselves. In the process, they evolved from provincial notables into independent actors. Thus, tactical consid­erations caused the rapid rise of Palestinian nationalism. Ultimately, Palestinian nationalism origi­nated in Zionism; were it not for the exis­tence of another people who saw British Palestine as their national home, the Arabs would have continued to view this area as a province of Greater Syria. Zionism turned Palestine into something worthy in itself; if not for the Jewish aspirations, Sunni Arab attitudes toward Palestine would no doubt have resembled those toward the territory of Transjordan — an indifference only slowly eroded by many years of governmental effort. Palestinian nationalism promised the most direct way to deal with the challenge presented by Zionist settlers — a challenge never directly felt on the East Bank. 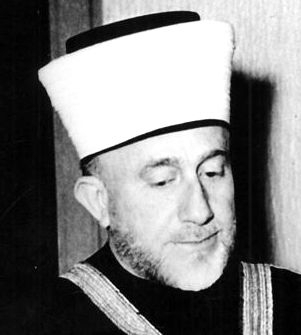 The mufti of Jerusalem, Al-Hajj Muhammad Amin al-Husayni (1895-1974). The career of Al-Hajj Muhammad Amin al-Husayni (1895-1974), the long-time mufti of Jerusalem, dramatizes the switch from Pan-Syrianism to Palestinian nationalism. Husayni began as a partisan of Greater Syria. He wrote sentimentally about ties between Syrians and Palestinians during World War I. When the Hashemites launched the Arab revolt, breaking the Otto­man Empire's four centuries' control over the Levant, Husayni saw this as a more effective way to block the Zionists. As Philip Mattar, a biographer of the mufti, writes: "Since it appeared futile for the Arabs to oppose British rule, Amin believed the only practical approach was to attempt to change the British Balfour policy by organizing mass support for reuniting Syria and Palestine, which would then work to­gether against Zionism." Husayni therefore deserted the Ottoman army and joined the Hashemites. He then became a leading agent of the Hashemites (an ironic development in light of his later mortal enmity with this family), recruiting about 2,000 military volunteers in 1918 and working actively on Faysal's behalf in 1919. At the Palestinian congress in January-February 1919, Husayni called for unity between Palestine and Syria. A British dip­lomatic report noted that Husayni's activities were directed "in favor of union with Sharifian [i.e., Faysal's] Syria." Husayni served as president of the Arab Club, which was especially eager for union with Syria. Toward the end of 1919, this group sent a letter to the British military governor of Jerusalem declaring that "Southern Syria forms a part of the United Syria beginning from Taures [and extending to] Rafa, the separation of which we do not tolerate under any circumstances, and we are as well pre­pared to sacrifice ourselves towards its de­fense with all our power." Returning from Damascus on April 1, 1920, Husayni introduced a new element into an already tense atmosphere in Pal­estine by reporting (wrongly) that the Brit­ish government would be willing to recognize Faysal as ruler of Palestine as well as Syria. This report raised Pan-Syrian ex­pectations to a fever pitch. Then came the Nabi Musa riots in Jerusalem on April 4, when Arab mobs attacked Jews; according to Horace B. Samuel (and the British police report corroborates his account), these dis­turbances were initiated by two young men who shouted "Long live our King — King Feisul." Taysir Jbara, a historian, believes that Amin al-Husayni was one of these two. The police sought Husayni, but he fled to Damascus, where he again worked to spread the influence of King Faysal. Al­though a Palestine court had sentenced Hu­sayni in absentia to ten years in jail, the High Commissioner of Palestine, Sir Her­bert Samuel, pardoned him less than five months after the Jerusalem disturbances had occurred. This permitted Husayni to make his way back to Palestine after the fall of Damascus. Faysal's defeat caused Husayni, like the other leaders, to change ideologies without missing a beat, turning into an un­bending Palestinian nationalist. He became mufti of Jerusalem in 1921, president of the Supreme Muslim Council in 1922, and pres­ident of the Arab Higher Committee in 1936. Each of these positions gave him new power; by the mid-1930s he had become the out­standing political leader of the Palestinians, the symbol and the bulwark of Palestinian nationalism. 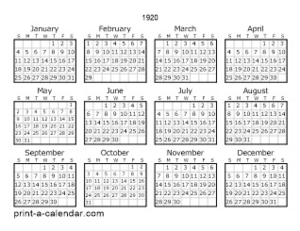 Four major events occurred in 1920. In March, Faysal was crowned king of Syria, raising expectations that Palestine would join his independent state. In April, the British put Palestine on the map, dashing those hopes. In July, French forces captured Damascus, ending the Palestinian tie with Syria. And in December, responding to these events, the Palestinian leadership adopted the goal of an independent Palestin­ian state. Having thus originated out of political calculus, not spontaneous feelings, Pales­tinian nationalism had to wait for many years to pass before it acquired real force. Still, what Palestinian nationalism lacked by way of natural origin, it soon made up for with passionate identification. How did a premeditated and novel allegiance come to exert so strong an emotional appeal? The logic of need caused Palestinian nationalism to flourish, and it became a popular cause. 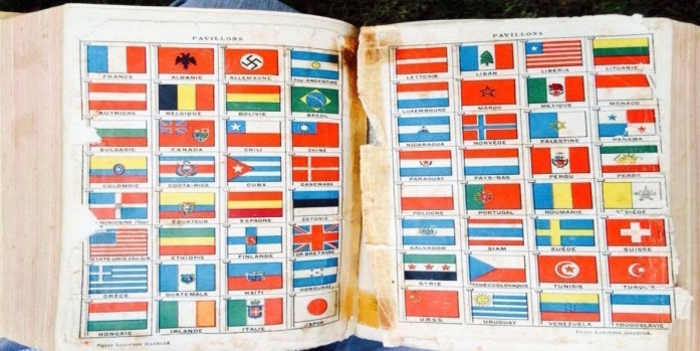 The Larousse dictionary shows an entirely Jewish flag of Palestine in 1939. It took a while for Arabs to warm to this geographic term. So thoroughly has it come to dominate the current scene that its recent and util­itarian origins have been forgotten by all but a handful of scholars. To make matters worse, an informal campaign seems to be underway to suppress the fact that Pan-Syrianism predominated for two critical years. A number of solidly researched aca­demic books of recent years wave this whole phenomenon aside in an effort retro­actively to enhance the stature of the Pales­tinian nationalism of those years. Second, 1920 demonstrates the extreme fickleness of the Arabs' nationalist loyalties. Only superficially grounded in nationalist sentiments, they found it easy to bounce from one formulation to another. Palestinian leaders supported the Greater Syria goal so long as it served their purposes; then, after the French capture of Damascus changed the premises, the leadership seamlessly adopted a new approach. During the 1950s, when Gamal Abdel Nasser and Arab nationalism were flying high, many of the Palestinian leaders moved into his camp. This could happen again. Were circum­stances to call for another switch, say, to federation with Jordan, many of those Pales­tinians who now fervently espouse an inde­pendent Palestinian state might take up this new aspiration. While it is true that the flexibility of 1920 occurred at a moment of special fluidity, and positions have hardened since that date, the Middle East remains the world's most politi­cally volatile area. Major realignments take place almost predictably, about once a dec­ade. Given that today's constellation of forces is unlikely to last into the distant future and that an independent Palestinian state does seem forthcoming, the primacy of Palestinian nationalism could eventually come to an end, perhaps as quickly as it got started. Mar. 30, 2009 update: For a sense of Christian and Jewish attitudes in 1920, note the excitement attendant upon General Edmund Allenby's conquest of Jerusalem on Dec. 9, 1917, as documented at "Jerusalem Falls to British, 'Great Rejoicing in the Christian World'." Is There a Palestinian People? Can It be Defeated?